Prepare a double boiler with water and bring to the boil or, if you don't have a double boiler, place a heatproof bowl over a saucepan of water. Make sure the bottom of the bowl isn't touching the water. Bring water to the boil over a medium heat. Turn heat down to medium-low. Add butter and sugar to bowl and melt. 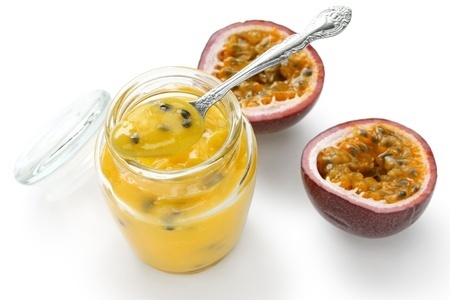 Add lemon juice and passionfruit pulp. Mix well. In a bowl, whisk all 5 eggs lightly. Add to butter mixture, whisking in with a whisk. Stir continuously with a wooden spoon until mixture thickens and coats the back of the spoon (about the consistency of thickened cream). This takes about 10 minutes over a medium heat. Remove from heat. Pour into hot, sterilised jars. Seal while hot.